Submitted by witness on Sunday, December 22, 2013. LOCATION DETAILS: It is the Southernmost gas station off of I-25 from Las Vegas, NM. It is a large service center. OBSERVED: My wife and I were driving home from Denver, Colorado to Albuquerque, NM and stopped at a gas station in Las Vegas, NM (I believe it was a Philips 66) at approximately 0100 on 10/18/2013. We pulled off of I-25 Southbound into the gas station parking lot. When we were driving down the frontage road towards the gas station, we saw a few vehicles on the far end of the parking lot with 3-4 people talking and a NM State Police cruiser was leaving the lot, however, upon parking in front of the gas station, we discovered that it was closed. I needed to pee rather urgently, so I ran around to the back of the station to find a dark place to do my business. I walked about 15-20 meters behind the gas station to be out of sight of the occupied vehicles in the gas station lot. As I was urinating I began to feel...uncomfortable. I was peeing in open ground and initially thought somebody was walking up behind me (probably to do the same thing). I craned a looked around and saw nobody and no animals; just a blanket feeling that somebody was very near me. As I finished peeing, I turned and began briskly walking back towards our vehicle. As I was hurrying back I turned to look behind me; and that is when I became a believer. Before I continue, I would like to preface my anecdote by alluding to my high-level of academic credentialing alongside my occupation as a healthcare executive. I also provide executive and technical advise to elected and appointed officials; I have worked very hard to become an expert based on empirical analysis and studied fact. I did not believe in Bigfoot, ghosts or another unexplained anomalies. I believed in results, hard work and, well, results. My perspective is now very different. 1) The creature was approximately 8-10 feet tall. I am 6"2 and this animal would have towered over me ( I observed it on flat land lending to my estimation). 2) The hair on the creature was matted, like dogs that live outside. The coloration was dark brown. 3) The creature had a defined gait. It took strides that I would estimate to be 3-4 of my strides per 1 of it's strides. 4) The creature had massive, human like hands. 5) The creature was very skittish, not moving until realizing I was observing it, lending to a higher intellect that a brown bear. I believe the creature may have even fled in fear. 6) I did not make eye contact, but noticed a massive brown and defined jaw and cranial structure. There is one other trait that I have since read about that may allude to this being a New Mexico Bigfoot. The air was rank with what I thought was the dumpster behind the gas station. However, this may be the "musk" eyewitnesses have reported in the past. I cannot be sure, but it was very powerful, and somewhat reminiscent of what I perceived to be urine. This incident was fearful and moving. I was unable to sleep for days and could not even bring myself to tell my wife until recently. Due to my profession and reputation, I have extreme, extreme reluctance about openly sharing my encounter. However, I have personal visual evidence of a so-called mythical beast, and I do not know what to do with it. Another fact: I have a concealed carry handgun license in the State of New Mexico and was carrying a 1911 .45 at the time of incident. I was so scared that reaching for my weapon would have been an afterthought. I was actually scared stiff. ALSO NOTICED: The animal was trying to stay hidden. Very cognizant of what I was and when I noticed it. OTHER WITNESSES: No. But there were people very nearby. I actually do not know if anybody else saw the creature. I fled to my vehicle and left very, very rapidly. OTHER STORIES: No. I did not believe in crypto-zoological animals until this occured. TIME AND CONDITIONS: 0100. It was chilly ( I could see my breath in the air). A moderately well lit area because of light splash from a nearby gas station. Enough to see a solid silhouette and some color. ENVIRONMENT: Rocky tundra with a nearby forest line. Pinon's, sagebrush and ragweed. I had the privilege of speaking on the phone and exchanging multiple emails with this witness. He reiterated his fear and wonderment of this early morning encounter. He mentioned that he is a highly credentialed scientist in the medical field. 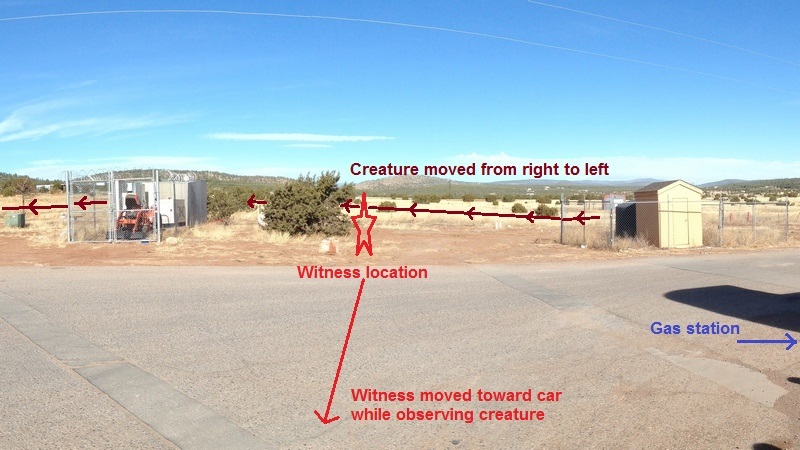 Having a scientific background, the witness finds this personal encounter challenges the rational concept that these animals don't exist per current scientific knowledge. He has a lot of trouble admitting this animal exists, but now must admit it. The witness has returned to the location during the daylight and provided some photos of the area. The area is very open. The witness now realizes that as he urinated the animal was out in the open and crouched down very close by. After daytime viewing of the area the witness also would like to revise his estimate of the animal's height to the 7 to 8 foot range. Further details were brought forth by the witness during our discussion. He remembers the area smelling like cat urine. The witness says it reminded him of a mountain lion's urine, a smell that he is familiar with in the past. Also shared, as the witness walked back toward his car he looked back over his shoulder and observed this animal rise up and move off. In his estimation the animal weighed 500 to 600 pounds. The hair was matted and dirty looking. It had long arms and human shaped hands. He noted that the animals hands were dinner plate in size. The animal used its arms for momentum as part of its rapid, fluid, swift stride. The witness describes the animals movement as graceful, clean and flowing with no head movement. The witness mentioned that he was armed at the time and felt that he was still overpowered as well as dumbfounded by what he was seeing. He commented that he felt the animal was annoyed by his presence. 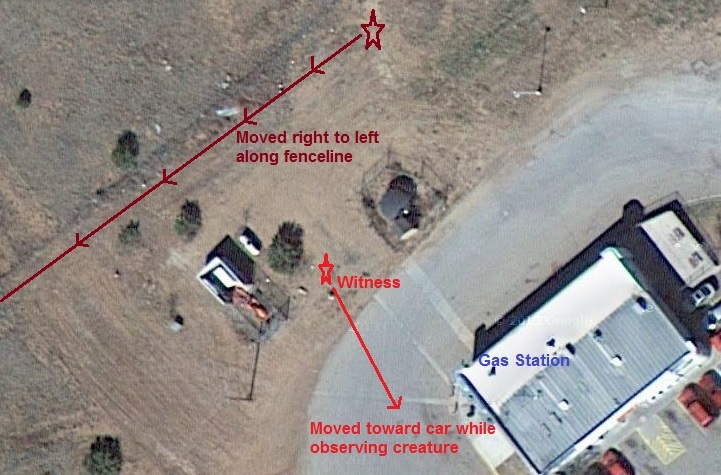 He also told me that he thought the animal was watching the activity of the other people in the area when approached accidentally by the witness. I looked at this gas station on Google Earth and determined that it also is a Subway sandwich shop. There is a dumpster in the area of this sighting. This could be a food source for this large animal? The Gallinas River is two miles east and the Santa Fe National Forest is directly to the west and north. I find the witness to be highly educated and sincere in all his statements. I'm glad the witness chose to share his remarkable experience with BFRO. Boyd has attended 2007,2011,2013 New Mexico, 2007 Oklahoma, 2008,2013 Washington Cascades, 2010 Washington Olympics BFRO expeditions. Plus many private research trips.